Okay, this one is rich. Chad is having a meltdown because in a restaurant in midtown Manhattan, some employees spoke Spanish to some customers, or each other, or something, who the hell cares? Yeah, he freaked the fck out, and threatened to call ICE on them. Accused them of living off HIS money, living off welfare, and because of those things, should be speaking ENGLISH DAMMIT. The young manager in whose face he was yelling stayed calm and defended the workers, and those things enraged Chad further, so he threatened to call ICE on them because of course, he assumed they were undocumented. Workers laughed at poor flustered Chad, customers said he was ignorant and fcked up, and when they were not intimidated, he finally sunk as low as he could, and fat shamed the person filming his freak-out. So, the internet being beautiful, found out who he is. TA-FRIKKIN-DA!!! Mr. Schlossberg earned his Bachelor of Arts Degree in English from The Johns Hopkins University and his Juris Doctorate Degree from the George Washington University Law School. 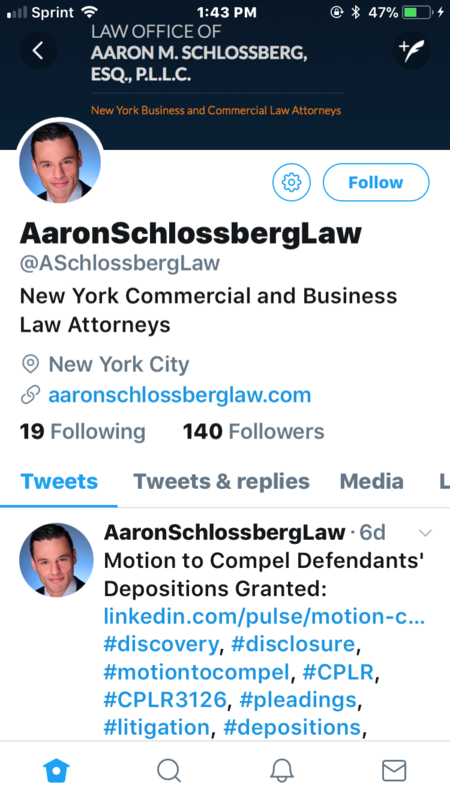 Mr. Schlossberg gained invaluable insight during his post-graduate judicial clerkship and significant experience as an associate with two midtown Manhattan law firms prior to founding The Law Office of Aaron M. Schlossberg, Esq., P.L.L.C., in June 2012. Okay, first of all, *I* went to Johns Hopkins University, so now I have to go throw up. Second of all, what kind of idiot lives in Manhattan, speaks fives languages for his job, and does not understand how the city is multi-lingual? Isn't he the one profiting off the fact that some people don't speak English, rather than the other way around? Third of all, it's not news that white people weaponize the police to intimidate and harm POC in this nation, but it would be a shonda (Yiddish for shame) if we stopped bringing attention to it, and calling out the white people who do it. It's also not a surprise that this guy is a Trumpanzee. Once again, the internet being amazing, someone found him, this time making the Jews proud by berating other Jews at a pro-Milo Yiannopoulos rally. When someone asks if he's Jewish, he says, "Of course I'm Jewish! I've been to Israel TWICE! Fck you!" Ten-to-one he's Trump's next nominee for the Supreme Court.